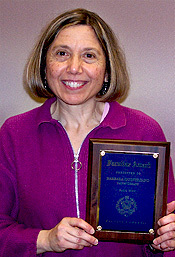 Barbara Quintiliano, instructional services librarian and coordinator of the nursing/biology library liaison team, recently received the Facultas Award for fall 2008. The award was presented by Villanova University President, Rev. Peter M. Donohue, O.S.A., Ph.D.; he was accompanied by two members of the Facultas committee, Victoria B. McWilliams, Ph.D., and Lillian (Boots) Cassel, Ph.D.
Barbara has been the Falvey instructional services librarian since 2003; she also serves as a research consultation librarian. Initially, she was coordinator of information literacy. In addition to her library responsibilities, Barbara participated in the Villanova University part of the Eyes Wide Open exhibit on the human cost of the Iraq war, organized by the American Friends Service Committee. She also presented “Torture as a Moral Issue” for the Villanova University Freedom School on January 21. Barbara noted, “I feel proud to be in the company of my colleagues here at Falvey who have also received the Facultas Award: Bente (Polites, fall 2004), Phylis (Wright, spring 2006) and Domenick (Liberato, fall 2007).” Even earlier, in 1996, the award was given to the late Therese Dougherty, a Falvey staff member who worked in interlibrary loan.